I’m guessing I was in middle school. Really, there’s not much I remember about why I was there or when I was there or even who was with me. I think it was probably a band field trip up to Pennsylvania for a music competition. But here’s what I do remember, walking into a large open room surrounded by windows and seeing table after table covered in crisp, bleached white tablecloths, each one set with an elaborate place-setting that included multiple forks and spoons. I’m just a teenage-ish girl away from home with a bunch of other middle schoolers about to eat at a place far nicer than our normal class trip stops at McDonald’s or Wendy’s. Even now, I’m the kind of girl who eats at restaurants where kids can get their drinks in styrofoam cups with lids and straws. (Okay, maybe I can get my drink in that styrofoam cup). This place was an intimidating beast of a dining room with significant glassware and cloth napkins. I grew up in a home where we learned table manners, so I knew how to put my napkin on my lap and not lean on the table with my elbows. Maybe you’ve never felt out of place or like a small and insignificant girl feeling a little overwhelmed and a lot like you don’t belong there. I’ve felt uncomfortable and unworthy. I’ve felt humbled and speechless and afraid to make one wrong move because maybe they’ll figure out the truth: that I’m an imposter who doesn’t deserve to be here. She got everything about how it feels to be an imposter welcomed to a table. Up to this point in the book of Ruth, the author has made a huge, whopping, big deal about the fact that Ruth is a foreign woman. Even worse, she’s a Moabite foreign woman. She didn’t even deserve to glean in the fields of Boaz and certainly wasn’t worthy of anyone’s notice, especially not someone as wealthy and powerful as Boaz. Yet, after months of watching Ruth’s hard work and seeing her faithful care for her mother-in-law, Boaz invites her to the table with his employees and blesses her with abundance. She eats everything she could eat and still had leftovers. Immediately, I thought of how much this sounded like Mephibosheth, the crippled son of Jonathan whom King David invited to share the king’s table night after night. Mephibosheth was the grandson of King Saul. When David became king, everyone expected him to kill anyone left alive in Saul’s family. Instead, David seeks out Mephibosheth and longs to show him kindness. And, crippled as he was, Jonathan’s son couldn’t even get to the king’s table on his own. He would have to be carried. I believe we all deeply long to be invited ‘to the table.’ It represents all things that speak belonging, acceptance, and the honor of being chosen. It is a picture of intimacy, conversation, nourishment, and safety (Ruth, p. 76). You and I, as unbelievable as it may seem, are invited to a table of abundance. Blessed are those who are invited to the marriage supper of the Lamb (ESV). How blessed indeed are we as believers to receive this invitation? Christ Himself spreads out a feast and asks us to come to the table. It’s an invitation we don’t deserve, not on our own merit or strength anyway. We’re like Ruth—foreigners. We’re the lowly and the poor. We’re the outcasts and the outsiders. Like Mephibosheth, we’re crippled and broken and we can’t even make it to the table all on our own. He covers us with His righteousness. He dresses us in the pure robes of His forgiveness. And, He bids us come and eat. 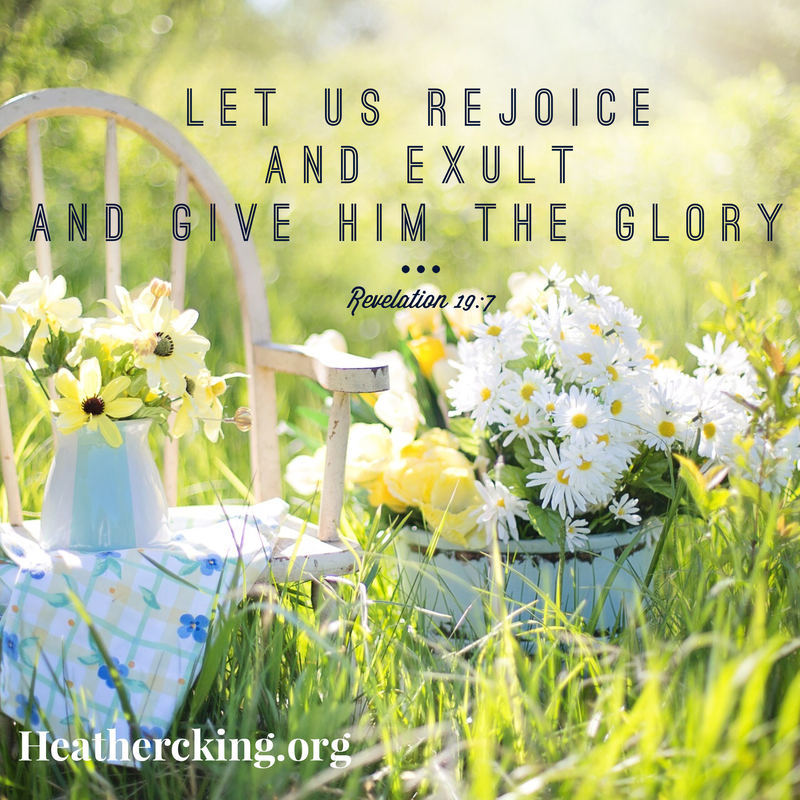 and give him the glory” (Revelation 19:7 ESV). Initially I am pleased to finding a Christian site. I will reserve my comments until I know the site better. In the meantime I shall continue my Lord every day and thanking Him for everything that I have for I am so blessed. I’m glad you found the blog, Eve, and that you are blessed and encouraged.